Professor Leon Dean was born December 8, 1889 in Bristol, Vermont; and graduated from the University of Vermont (UVM) in 1915. He taught English and Creative Writing at UVM from 1923 until his retirement in 1956. During his career he helped many aspiring writers by conducting seminars for school newspaper editors and evening adult courses in creative writing. 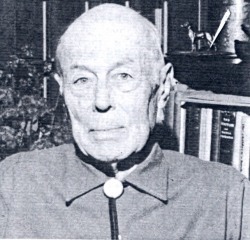 He founded the Green Mountain Folklore Society in 1948 with a notice in the Burlington Free Press. Anyone interested in forming a group dedicated to the collecting and preservation of folklore was to meet at Southwick Hall on the UVM campus. This was the beginning of the Society's 62 years of preserving Vermont's folklore by publishing it in the Potash Kettle or Green Mountain Whittlin's. Professor Dean also wrote stores about Vermont's legendary heroes, such as Ethan Allen, Remember Baker, and John Stark. He was interested in preserving Vermont's Folklore, which he defined as "the expression of a people through their arts and their crafts, their songs and their stories, the practices, manners and customs by which they live. It is grass-roots stuff, coming up from the people themselves and hanging over them like a mirage, reflecting their way of life."